The past few days we have been working on some custom lettering. As we discussed in class, before the advent of the computer every letterform and typeface was crafted by hand. Take a few minutes to watch this video about master penman Jake Weidmann. Stop and consider the concentration and commitment that it would require to create images like Weidmann. Afterwards, please locate and post an example of custom lettering that you believe is exceptional. Make sure you explain why you chose the image that you chose and that you credit the artist. If you’re really curious, take a few more minutes to watch Jake Weidmann give a Ted Talk in Colorado. — The concentration and commitment that it would take to make images like Weidmann is insane. Personally, my hands would get shaky from the thought of having to start over if I mess up. Weidmann, on the other hand, shows a willingness to start over and over again, even at the slightest mistake. And I can’t even imagine trying to retain my focus after writing for several hours. — The example of custom lettering that I found that I believe is exceptional is from https://www.behance.net/gallery/48737891/Custom-Lettering by Laura Beckman. — Obviously, there is more than one example on the link, but I found them all to be exceptional. I found it really interesting how she integrated texture and shading into a lot of the custom lettering she did. It gave the lettering a “3D” effect and rustic feeling that really stood out to me from other custom lettering I’ve seen. Also, for some of the lettering she did at the bottom, I found it really amazing how the type flows so well with the “design” around it — it all seems very natural. Overall, the originality of her lettering compared to others that I’ve seen so far is what made made me feel that her lettering is exceptional. http://www.imgrum.org/media/630533333231397473_209849921 I believe this custom lettering is exceptional and interesting. I don’t know the artist’s name, but he goes by “graphic maniac.” I chose this custom lettering because i really like the style; it’s very appealing. It is a bit flowy with some curves, and “warrior” is 3D. I especially like the “W” because it is shaded and just looks pretty rad. I chose this custom lettering image because its unified, balanced, and uses design principles effectively. I really ljke this piece and credit the artist because its bold and visualky intresting. It swwms as though thw artist put alot of time and effort into it. The reason why I chose the image above for a “exceptional” work for lettering is because of the style and the work he does. The artist is Alexis Taeib, a freelance graphic designer from Paris, France. He does his own custom lettering in branding, packaging, etc. He mainly focuses around sports, specifically Fùtbol/Soccer which is how I found out about him. In this specific design, I really like the way how he took the teams logo and added his own style with the team name that also has a feeling with where the team is from and how they are. It also has some depth to the words which make them “pop” from the team logo itself. This is a design created by Jessica Hische, and I believe this design is exceptional. 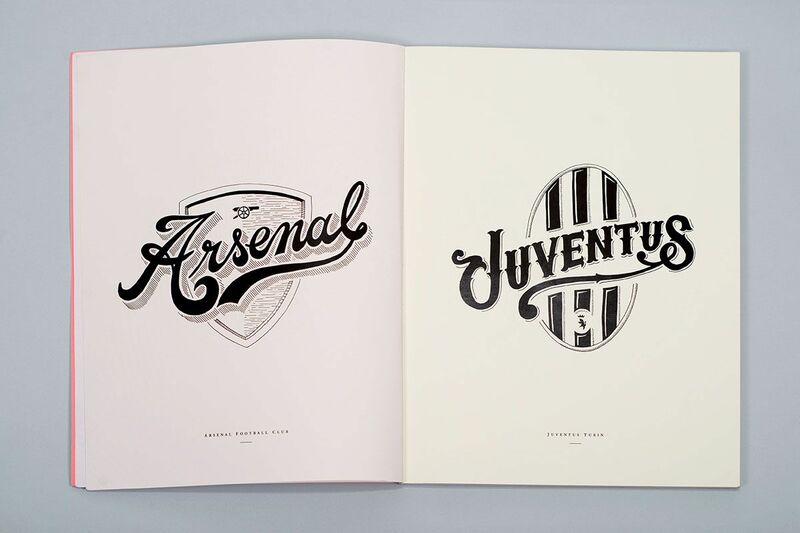 It uses the fundamentals of typography very well, and the design focuses on typography rather than images. Plus, it is also easy to read. Jessica Hische used custom lettering to created this design, and used some shapes to unify the text a little bit more. The main focus is the “The CAA Friday Night Party”. The text has a Vegas feel, helped with the shapes that also have a Vegas feel. What I am saying here is the design is very well unified. The design itself does what it was intended to do, which was to be an invitation to a party located at the Greystone Mansion, located at Beverly Hills on the date February 22nd, 2013. I found Jake Weidmann’s artwork amazing. The commitment and elegance of it is mind blowing. I was also surprised that there are only 12 master penmen in the world. I have high respect for artists like Jake who could spend a year on one piece. I chose this example of custom lettering because it is very quirky and fun. This artist’s style breaks the norms of most lettering, which is usually being perfect and aesthetically flawless. I also like how the custom lettering is combined with other artwork of the artist to add to the loose feel of the design. This is a perfect example of beautiful custom lettering it’s simple yet very elegant and appealing to look at. I chose this great piece of lettering because it is very eye catching. It is very decorative without going overboard on the detail. It is also very balanced and unified. 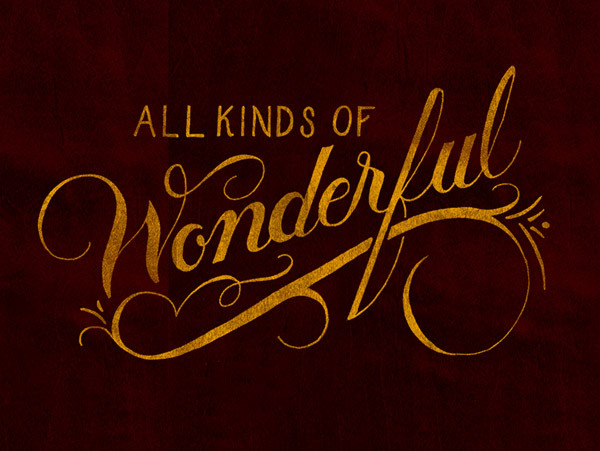 Nicholas uses a lot of emphasis on of the word “Wonderful” to show that it is important and special. With the way Nicholas used the word “Wonderful” they almost leave magical or mythical feeling to it. To me this custom lettering by Nicholas D’Amico looks and feels exceptional and I hope anyone who sees this somewhat agrees with me on this. An example that i found was Joel Lapointe’s “shut up and train” illustration. Lapointe is an artist who was hired by a women’ boxing gym. He was asked to create a design that would empower women. This design stood out to me because of not only the message it successfully portrays, but because of how he uses 2 different custom typfaces to still create a unified design. He also doesn’t make every word capitalized and his color scheme is well thought out and makes the letters “jump” off the wall. Also while looking at his website I noticed that the typeface in his artwork is almost siimilar to the design that I chose.